The discovery of a relatively large number of active natural ingredients in its formula explains why the essential oil of lavender has had many traditional uses. Are most often listed indications such as antiseptic, analgesic, anti-inflammatory. The oil is used as a spray for respiratory problems, headaches, or applied in a massage oil for muscle pain. The aromatherapist also recommends lavender for its relaxing and soothing properties. 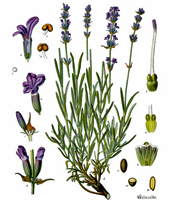 In the environment, lavender is used as an antiseptic and insect repellent.